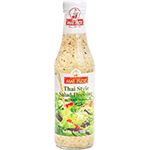 Maeploy brand Thai style vinaigrette salad dressing. Ingredients: Water, Sugar, High fructose syrup, Distilled vinegar, Coconut gel, Salt, Garlic, Lactic acid (Acidulant), Red chilli, Coriander leaf and Xanthan gum (Stabilizer). Product of Thailand.